San Antonio Bible Heralds: Does This Kind of Love Win? This all comes after he spends the better part of his introduction loosely quoting several scriptures that, judging by the comments he makes about them, in his view contradict each other. So, for example, he will quote a scripture where we are told we must believe and then immediately quotes a scripture that speaks to us needing to do certain things. He will quote scriptures, completely without context or exegesis, that speak to believing and doing and then ask, seemingly aghast, how in the world we’re supposed to know what exactly the Bible wants us to do to be saved, believing or doing! It is obvious that Mr. Bell is no theologian, and that his desire is not to find out what the truth about salvation is, but rather to ensure that what Christianity has believed for centuries that the Bible teaches, is not what salvation “really” is. Many egregious examples could be offered for Mr. Bell’s sloppy handling of the text of scripture, but perhaps one of the worst is in his treatment of the Rich Young Ruler story of Matthew 19. Just about anyone with even a cursory knowledge of the Bible is likely to have read or heard the story of the young man’s encounter with Jesus. In it, he asks Jesus what he must do to inherit eternal life. Jesus’ response is direct as he instructs the young man concerning his real problem. When Jesus tells the young man that he must keep the commandments, he is simply making an important point, not about the commandments, but about human nature. The young man claims to have kept all the commandments from his youth on and Jesus tells him there is one thing he lacks. He must sell all he has and come follow the Lord. At that, the young man goes away sorrowful, Matthew adding that it was because he had great possessions. Obviously, greed was this young man’s perhaps fatal flaw. But the real point of the story is not that we cannot inherit life if we’re greedy or not keep the commandments or not take care of our fellow men. That all is true up to a point. But the point of the story is how Jesus showed this young man, and by extension all those who heard him then and who read about it now, that there will always be something that will cause us to come up short. We cannot, of our own free will and effort, inherit life. What Jesus really wanted to emphasize was what he said at the end, “come follow me” and that is the point that Mr. Bell completely misses. As a matter of fact, he doesn’t even quote that last clause! It is as if it didn’t exist at all, and by ignoring it the way he does, he can then go about trying to prove that what we do regarding our fellow man is the one “magic bullet” that will decide our destiny. 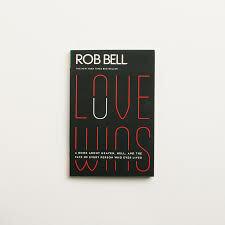 “Love Wins” is really nothing more than another attempt, as if another one was needed, to try and tell us that heaven and hell are right here on earth and that our actions are what determine our destiny. Since, Mr. Bell tells us, even the devils believe that Jesus is the Son of God, then belief can’t be the reason we are saved. The answer has to be somewhere else and that somewhere, according to Mr. Bell, is in what often has been referred to as “the social gospel.” Be good to each other, treat each other with respect, alleviate suffering and all will be good. Since we’re going to have heaven right here on earth and God will banish all bad “stuff,” then we need to lend him a helping hand by working to bring about utopia right here, right now. And if heaven is going to be here, then that means that hell also must be. After recounting some of the horrors he saw during the Rwandan civil war (children with missing limbs and the like), Mr. Bell moves on to another of his amazingly bad handlings of the Scriptures. This time, he uses the story of the rich man and Lazarus in Luke 16 to try and convince us that Jesus wasn’t really speaking of literal destines, but rather that each of the images in the story represents something else. In an allegorical manner that would make Origen proud, Mr. Bell tells us that the rich man just didn’t understand what doing right was all about. In asking Abraham to send Lazarus to give him something to drink, he was still insisting on being superior to the beggar. And, as if that wasn’t bad enough, he tells us that the chasm between the one side he’s on and the other, was not a literal one, but rather the chasm that separated the rich man’s heart from doing the right he should have. Above all of these sadly misguided attempts at redefining what the Bible says, the greatest danger in a book such as this, is that it completely misses the fact that salvation and the scheme of redemption are all about God. Redemption has very little to do with us. God brings it about to display his glory and his glory alone. And He does so, not only in the redemption of an undeserving people as a gift of divine love to his Son, but also in the display of his wrath upon those who have rejected him and who love their sin. One important issue that Mr. Bell, and I dare say all those who are blinded to their sin, miss is that man is depraved and hates God. We’re not all neutral gentle souls who, with the right push will become God lovers. We are active God haters who, without the regenerating work of the Spirit, will never, ever come to God. If we miss that fact, we will, like Mr. Bell, go looking for the solution in all the wrong places and we will make of the glorious scheme of redemption a sham!